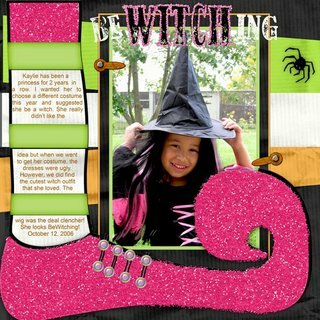 Photo prongs and Title are from Taran Conyer’s BeWITCHing kit, SBG. Spooky page set by Sausan Designs/Sylvie Wagner, SBG. Note: The glitter shoe was recolored to suit my layout. I really like this layout - you have combined different elements really well, and yet the photo is still the focus. Gorgeous!